Dutch Design Week is fast approaching; 21st – 29th October in Eindhoven. We are very proud to announce that four of our members have self-initiated an exhibition titled ‘Conscious Creativity’. This Amsterdam-based collective of designers, entrepreneurs, inventors, technologists, makers and creators includes Polimeer, Imagination of Things, S.E.T. (Atmospheric Wood), and Duncan Gidney. Their diverse projects are unified in the thoughtful dialogue and approach to technology & craft, local & global impact and analogue & smart. With their interdisciplinary systems-thinking approach they aim to stretch design boundaries to explore consciousness. Using their creative energy they construct a tangible vision of our future society. And they look into how we can encourage individual responsiveness to and responsibility for our surroundings. Their showcase at Temporary Art Centre will be seen by 20,000 visitors over the week (find them exactly here). The exhibition is part of TAC’s theme “Trajectories – Future Pathways in Design” which presents upcoming designers who dare to make a next step. 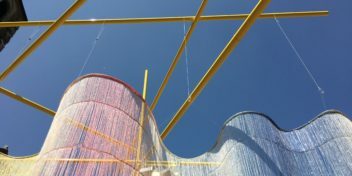 An amazing feat of stamina and creativity, Niels Hoebers will collaborate with DDW visitors to create a super unique piece. I love it when creatives give themselves challenges in order to produce work and this seems like the maximum challenge possible! Eco-oh! is making a name for itself in supporting creative projects that can boost innovation around plastic recycling. 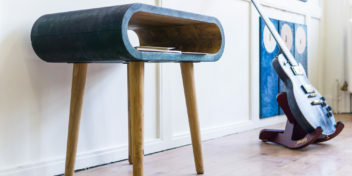 Recognising that plastic household waste is not at all an easy waste stream to recycle it is great to see companies reaching out to designers to generate ideas for higher quality output. Studio Beck works with design fictions, performances and fictional objects to make comments about how we organize our society. Definitely check out their objects and stories. As more and more technology enters our lives, we need to be conscious of its designers and their biases. Having the things we use in everyday life often designed by young white males can have it’s issues. With facial recognition unable to detect people of colour and other prejudiced algorithms, we need to thing about how the future can be inclusive for all, not just its creators. Baltan Laboratories at NatLab presents projects that intersect between design, technology, and science. From the Economia Festival to the Age of Wonderland from last year I always trust them to have thoughtful programs. This exhibition highlights the importance of research as part of the design process. We at Polimeer believe this is essential to creative solutions and sometimes surprising aesthetics. The way in which universities, larger companies and small design studios have collaborated on the circular design challenge of the Arena chairs is a great example of collaboration. This showcase presents 8 prototypes that transform the old stadium seats of the Amsterdam Arena into new objects. The seat was designed by Robin Day in 1963 for the British manufacturer S.Hille.Co. We believe the arena chair is a variation of the Polyprop chair, firstly used in the Olympic Games of Mexico City. Tens of millions of Polyprop chairs have been produced in the last 50 years. This chair is an “invisible” design icon and it has been widely used in both domestic and public spaces. In 2009 it was selected by Royal Mail to appear on a postage stamp as one of eight designs in a 2009 series celebrating “British Design Classics”. This is a 3d printer that uses biocomposite plastic to produce tailor made “soft-objects”. Aiming to create competitive sustainable products made by local manufacturers is a great challenge. Sustainable! tailor made! And competitive! Sounds like a recipe for success – we are very curious to see this exhibition. This is an example of social design that inspires us hugely. They manage to boost talent and fast forward social inclusion through design. This enterprise raises awareness about equality and exemplifies the value that newcomers bring to their society. I believe this exhibition is very interesting both in terms of material research and the analysis of the design process. Be sure to check out Conscious Creativity at #DDW17 – we look forward to seeing you there.